Madrid's main park, El Parque de Retiro, is not far from the city's main tourist attractions such as the Prado Museum, and is a popular and magnificent place for a stroll. Home to several sculptures, monuments, and a boating lake, it also presents an annual book fair, and there are free concerts throughout the summer. Many local families spend their Sunday afternoons here, renting a horse-drawn carriage or paddling a rowboat in the pond. But it wasn't always this democratic, as in the 17th century only the royal family was allowed to use it privately, hosting pageants, bullfights, and mock naval battles. Only a century later did it open to the public, but even then visitors had to be formally dressed to enter. It takes its name from King Felipe IV's 17th century royal palace that once stood on this site, but all that remains of it is now the Casón del Buen Retiro, a building that was then part of the Prado Museum but that after renovation is now an educational center. A second part of that palace housed the Army Museum ("Museo del Ejército") for years, but it was decided that it should move to the city of Toledo and make the building part of the Prado Museum. 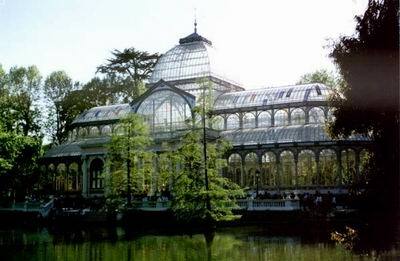 Here you'll also find the 19th century Crystal Palace ("el Palacio de Cristal"), built in 1887 to hold the Philipines Exhibition and once home to exotic plants, but now used for temporary exhibitions. You'll also see the attractive neo-classical Velazquez Palace dating from the same time and also used as a venue for different events throughout the year, many of which organized by the Reina Sofia Museum which is not too far away. 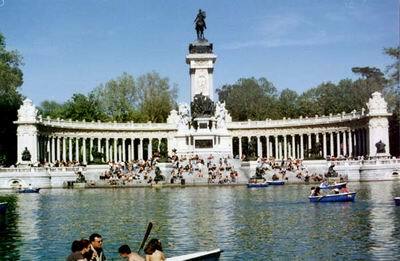 By the lake is a half-moon colonnade with a monument to King Alfonso XII, with his equestrian statue facing the park. Opposite, portrait painters and fortune-tellers vie for your attention.